If you've got a story to tell then let us know. Make sure it's about athletics though. 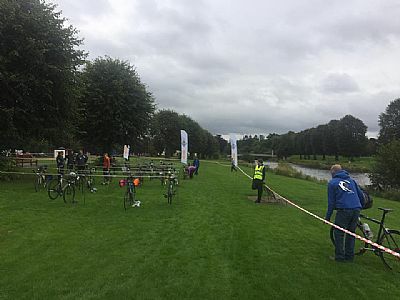 Peebles was my second Duathlon of the season, the first being Carlisle in March. Carlisle was very wet and windy and if it had been my first experience might have put me off. Even thought the weather forecast was rain it held off till most of the competitors finished. It was an early start for me up at 6:30 to get breakfast and then I left the house at 6:55 for the hour drive to Peebles. Registration opens from 7am till 8:30 with the race brief at 8:40 and the race starts at 9am. The distance was 5km run then 20km cycle and the same 5km run again. The run had been changed from previous years where it had been along the banks for the river tweed and over a couple of foot bridges. The previous course was slightly under 5km but was flat. The new course took in a loop round a park and had a few steps and a climb along a tight path. The first lap with runners still bunched did mean we had to avoid park benches every 20 meters. Can’t remember them being mentioned in the race brief! As far as I know no one ran into them as hitting a bench at shin level would have resulted in a DNF. A short decent through a wooded area did help me as I seemed to be able to descend faster than most of the people around me, I am putting this down to running the winter league and some of the courses we race over. After an ok transition, but I still need to work on changing my shoes at speed, it was a short run out of transition to the main road to start the bike phase. The cycle route is an out and back along the back road to Innerleithen, it is a undulating course with a few short climbs and descents and a couple of sharp turns that keep you sharp, maximum speed achieved downhill 36 mph. It is on open roads so other traffic is another factor, watching for cars coming the other way. One of the good things about a duathlon is people have different strengths. Coming out of transition I could see a few people up the road and set off after then, catching one guy in the first 2 miles but I also had a couple of the stronger cyclists coming past me. At the turn at 6 miles I had managed to catch up with a group of 4other riders. The race was a ‘non-drafting’ which means that you are required to stay 7 m behind the rider in fount unless you go for an over take. I tried my best to stick to the 7 m but some of the other riders did seem to think it was 7 feet. Some bunching did happen on the climbs which allowed me to take 3 riders. After a quicker second transition it was the second run. The second run was slightly slower that my first run but after an hour of hard effort was only slighty down. The steps though the park were much harder this time round. I still managed a good steady pace for the final 5km. My time this year was quicker than 2 years ago with the cycle 3 minutes quicker, even though on the bike I was wishing I had done some more hard efforts on the bike in training. I finished 31 out of 54 competitors and first ADAC home! (only ADAC in the race) The field was 18 down on 2016 which is a shame as this is a well organised event over a good course. For anyone that has not tried a duathon it is more than a couple of runs and a cycle and the technical aspect and transitions meaning you have to think and plan your race more that a run. I do like the challenge and extra planning involved. Comment from johnny minto at 21:48 on 13 October 2017. 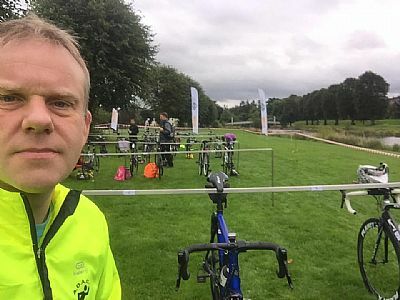 Great insight into a duathlon race Richard . Well done on a great ADAC season.